This easy hike begins at the Mirador de Morro Velosa, and just about 5 miles away, on the mountain called Morro Janana. The trail goes over the crest of the mountains that separates the village from the town of Antigua Bertancuria, and not too hard to navigate. 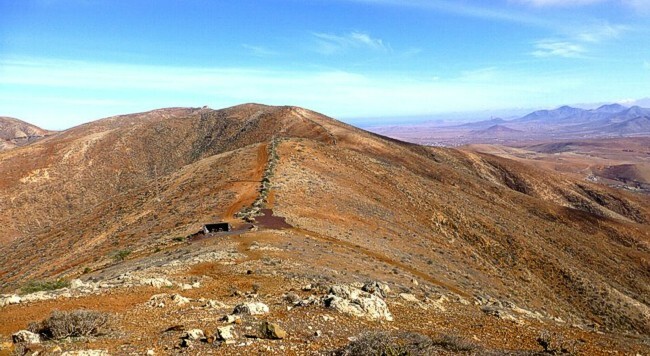 On the path, go up and down several mountains, all of fairly level, and from where we will see the Great Valley of Fuerteventura on one side, and the Valley of Betancuria. At halfway there is a small rest area, where we can walk down a path to Betancuria, or we can go to the town of Antigua. Before coming to Morro Janana, we recognize that a large number of phone masts, we can see right the only forest of Fuerteventura: Lara Castle, where there is an entertainment area with barbeques, chairs and tables and toilets , and is a perfect place to eat.